I absolutely loved working with Lisa Yarbro. She was thorough, organized, and efficient in every detail coordinating my wedding, and my special day was absolutely perfect! I not only consider Lisa my wedding coordinator, but one of my great friends. She really took the time to get to know my husband and I and what was important to us to make our dream wedding a reality. I highly recommend Lisa Yarbro! Lisa is one of the most down-to-earth, genuine people I know. She is not just a wedding planner, but a dear friend. I always looked forward to our meetings because she is such a joy to be around. I left every meeting feeling like a big weight had been lifted off my shoulders. I knew that I could count on her no matter what, and also took comfort in her calming words. Did I mention that Lisa is a saint? I cannot count how many times I reached out to Lisa (often e-mails in the form of a novel). She responds to every e-mail within hours, and makes sure to address each question. On the Thanksgiving holiday I had to request that she enjoy her holiday and not respond to my e-mail (of course she responded, answering my questions and sending me warm wishes on my holiday). I was beyond impressed with Lisa’s background and experience in this industry. She is knowledgeable, stylish, and classy. She truly knows what works, and what doesn’t work. She also has a deep respect for the bride, groom, and their family, and will do whatever it takes to bring your dreams to life. Whenever I had a question or worry, she immediately offered a solution. When our wedding day came, we had ZERO worries. We knew our wedding day would be fun, but words cannot describe how much fun we had. We truly had our dream wedding, and this was thanks to Lisa. She executed everything with perfection, from the timeline to the décor. After finishing our father/daughter and mother/son dance, she even had a glass of wine ready for us. She truly thought through every single detail. The flow of our wedding was very important to us. Everything flowed beautifully, and this was all thanks to Lisa. Lisa has a HUGE heart and magnetic personality. It only took our family moments to fall in love with her as well. Words cannot express our gratitude for Lisa. I truly could not have planned and executed this wedding without her. We feel so blessed that she was brought into our lives, and know that she will bless many others as well. Although our wedding has passed, we know that we will remain in each other’s lives for years to come. Thank you, Thank you, Thank you Lisa! 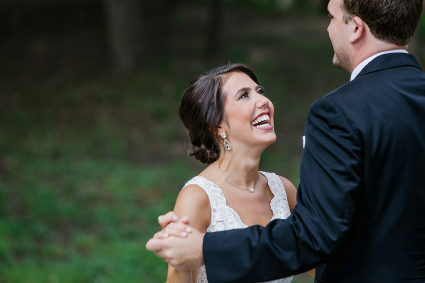 We could say it a million times and it will still not be enough to tell you how you made the planning and the actual wedding day for David and Sarafina go so smoothly. You came prepared and ready to make every wish come true. You some how managed to find the perfect venue within our budget and worked with the chapel, florist and cake arrangements. You are a one woman show! Always pleasant and willing to go the extra mile. We could not imagine accomplishing all that had to be done in such a short time without your help. Your work is top notch. You have an eye for visualizing the end result in an empty room. Creativity at its best. We appreciate and respect the person behind the name. Weddings By Lisa Yarbro! There are not enough adjectives to describe this wonderful woman and the incredible service she provides. Lisa is warm, kind, PATIENT, and truly made our wedding day smoother than I thought possible. 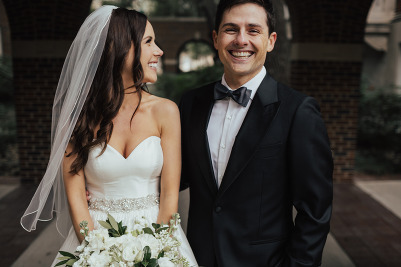 She truly knows her weddings, and covers every base imaginable – she handled vendor communication, helped with set-up on the day of, wrangled bridesmaids and groomsmen, and managed about a million other details that I probably won’t ever know about. 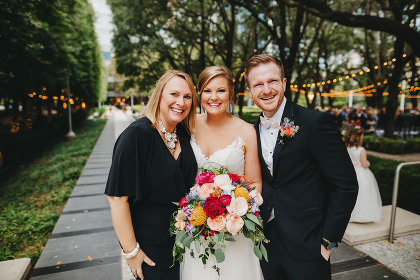 Most importantly, she allowed my parents (who live in Baltimore) to come to town for the wedding and focus on being here and enjoying their time, as we had developed such a trust in her so quickly that we knew she would make the day amazing – which it was. Lisa is not just another vendor – she will become your friend, and any wedding she is involved in is certain to be wonderful. “Lisa is simply amazing at what she does! I absolutely loved my wedding and I have Lisa to thank for helping us pull it off without a glitch. She executed my wedding to perfection and had the best advice during the planning process. Zach and I were married June 13, 2009 at Marie Gabrielle, and I still to this day remember feeling totally relaxed and calm because I knew Lisa had everything under control. I knew she would make sure our ceremony and reception went as smoothly as possible, and it did! It was so fun and beautiful, and on the actual wedding day, I left all of the details up to Lisa. I focused on enjoying the day with friends and family because I trusted her completely. She took charge when she needed to and was always very respectful and kept our wishes in mind the entire time. It was truly the day I had hoped it would be, and I truly believe Lisa was a big part in making our day so special!